The purpose of this policy is to set out the requirements of Ontario Regulations 191/11 Integrated Accessibilities Standards Regulations (IASR) which reflect a number of accessibility standards that Pheasant Run Golf Club is required to meet. Pheasant Run is committed to training all people in a way that allows them to maintain their dignity and independence. We believe in integration and equal opportunity. We are committed to meeting the needs of our members, guests and employees with disabilities in a timely manner, and will do so by preventing and removing barriers to accessibility and meeting accessibility requirements under the AODA. a) The goods or services must be provided in a manner that respects the dignity and independence of persons with disabilities. b) The provision of goods or services to persons with disabilities and others must be integrated unless an alternate measure is necessary, whether temporarily or on a permanent basis, to enable a person with a disability to obtain, use or benefit from the goods or services. c) Persons with a disability must be given an opportunity equal to that given to others to obtain, use and benefit from the goods or services. Assistive Devices: Pheasant Golf Inc. permits a person with a disability to use and keep with them their own personal assistive devices to obtain, use or benefit from the goods or services offered by Pheasant Golf Inc.
Communication: Pheasant Golf Inc. workers, when communicating with a person with a disability, shall do so in a manner that takes into account the person’s disability. Service Animals and Support Persons: Pheasant Golf Inc. shall allow a person with disability, who requires to be accompanied by a support person or guide dog into Pheasant Golf Inc.’s premises that are owned or operated public facilities. The person is permitted to keep the guide dog with them unless the animal is otherwise excluded by law. Training: The Club will provide training to workers, volunteers and others who deal with the public. Managers, customer service workers and maintenance workers. This training will take place as soon as is practicable and upon completion, records of training will be kept and made available upon request. Pheasant Run’s plan related to the customer service standard. How to use the automated door and location of wheelchair accessible washroom. Workers will also be trained when changes are made to your accessible customer service plan. Feedback process: Customers who wish to provide feedback on the way Pheasant Golf Inc. provides goods and services to people with disabilities can email, call or speak to a manager in person. 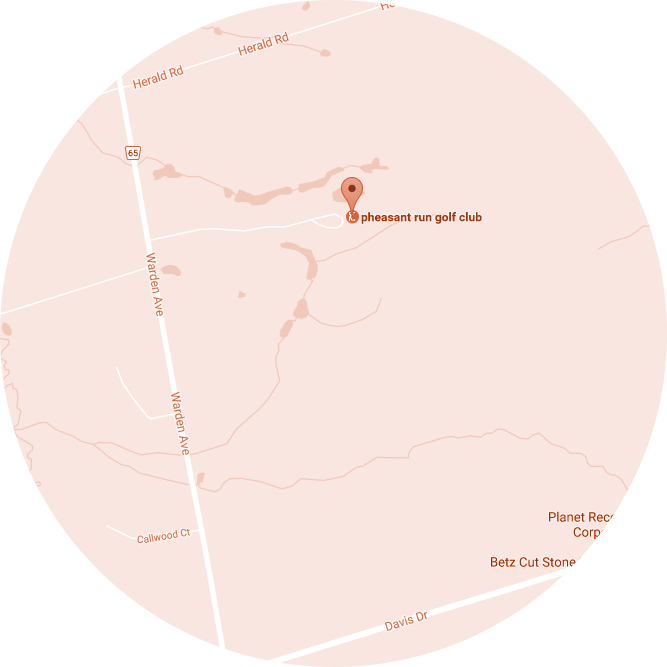 All feedback, including complaints, will be directed to the President of Pheasant Golf Inc. Craig Evans: cevans@pheasantrungolf.com, 905-960-3917. Customers can expect to hear back in one weeks’ time. Modifications to this or other policies: Any policy of the Club that does not respect and promote the dignity and independence of people with disabilities will be modified or removed. Educate workers and ensure compliance with all aspects of the policy. Demonstrate behaviours that are consistent with the policy. Provide support and guidance to worker members in fulfilling the policy. Ensure all workers are trained according to the requirements of the legislation. When aware of areas of non-compliance ensure appropriate action is taken. Comply with all aspects of the policy. Participate fully in training as it relates to this policy. When aware of areas of non-compliance ensure the manager is notified. The Accessibility for Ontarians with Disabilities Act, or AODA, aims to identify, remove, and prevent barriers for people with disabilities. The AODA became law on June 13, 2005 and applies to all levels of government, nonprofits, and private sector businesses in Ontario that have one or more employees (full-time, part-time, seasonal, or contract). Employers, and service providers can start by doing an accessibility review of their facilities, services and procedures to see what barriers exist. You can then make an accessibility plan and begin to remove the barriers. Many accommodations can be made easily, and at low cost. In some cases, putting the best solution in place right away may result in “undue hardship” because of costs or health and safety factors. Even if this happens, you still have a duty to look at and take next-best teps that would not result in undue hardship. Such steps should be taken only until more ideal solutions can be put in place or phased in. Pheasant Run is committed to improving the accessibility needs of people with disabilities and providing equal treatment and opportunity to people with disabilities with respect to accessing services, accommodation and employment in a way that respects their dignity and independence. The Integrated Accessibility Standards, Regulation 191/11 (“IASR”) under the Accessibility for Ontarians with Disabilities Act, 2005 (“AODA”) establishes standards to address barriers that persons with disabilities face in the areas of information and communications, employment and the design of public spaces. The Accessibility Standards for Guest Service, Regulation 429/07 under the AODA establishes accessibility standards for providing guest service to persons with disabilities. The requirements under these standards are not a replacement or substitution for the requirements of the Ontario Human Rights Code (the “Code”). The purpose of these policies is to put in practice our responsibilities under the AODA and to ensure that the Club complies with the Government of Ontario’s accessibility standards. Application The Club strives to meet the accessibility needs of its employees and the public it serves. As such, the practices and procedures in these Accessibility Policies apply to all Club employees, volunteers and individuals that provide services or interact with people with disabilities on behalf of the Club. Auxiliary aids such as communication aids, cognition aids, personal mobility aids and medical aids (e.g., canes, crutches, wheelchairs or hearing aids). Supports facilitating effective communications, including captioning, alternative and augmentative communication supports, plain language and sign language. As per the Code, means: a) any degree of physical disability, infirmity, malformation or disfigurement that is caused by bodily injury, birth defect or illness and, without limiting the generality of the foregoing, includes diabetes, mellitus, epilepsy, a brain injury, any degree of paralysis, amputation, lack of physical co-ordination, blindness or visual impediment, deafness or hearing impediment, muteness or speech impediment, or physical reliance on a guide dog or other animal or on a wheelchair or other remedial appliance or device; b) a condition of mental impairment or a developmental disability; c) a learning disability, or a dysfunction in one (1) or more of the processes involved in understanding or using symbols or spoken language; d) a mental disorder; or e) an injury or disability for which benefits were claimed or received under the insurance plan established under the Workplace Safety and Insurance Act. Every person who deals with members of the public or other third parties on behalf of the Club, whether the person does so as an employee, agent, volunteer or otherwise. Individuals who have a disability as defined under the Code (as above). Animals individually trained to do work or perform tasks for the benefit of a person with a disability. Any persons, whether a paid professional, volunteer, family member, or friend, who accompany an individual with a disability in order to help with communications, personal care or medical needs, or with access to services. persons with disabilities may use assistive devices, service animals and support persons as is necessary to access the Club’s offices and services unless superseded by other legislation. We are committed to serving people with disabilities who use assistive devices to obtain, use or benefit from our services. We will ensure that all staff, volunteers and others dealing with the public are trained and familiar with various assistive devices that may be used by guests with disabilities while accessing our services. We are committed to providing fully accessible telephone service to our guests. We will train employees to communicate with guests over the telephone in clear and plain language and to speak clearly and slowly. All staff, volunteers and others dealing with the public will offer to communicate with guests by web-based guest care request, e-mail or fax if telephone communication is not suitable to their communication needs or is not available. We are committed to providing accessible invoices to all of our guests. For this reason, invoices will be provided in the following formats upon request: hard copy or e-mail. All staff, volunteers and others dealing with the public will answer any questions that guests may have about the content of the invoice in person, by telephone or e-mail. We are committed to welcoming people with disabilities who are accompanied by a service animal on parts of our premises that are open to the public and other third parties. All staff, volunteers and others dealing with the public will be properly trained in how to interact with people with disabilities who are accompanied by a service animal. We are also committed to welcoming people with disabilities who are accompanied by a support person on parts of our premises that are open to the public and other third parties. Any person with a disability who is accompanied by a support person will be allowed to enter the Club’s premises with his or her support person. The Club will provide guests with notice in the event of a planned or unexpected disruption in the facilities or services usually used by people with disabilities. This notice will include information about the reason for the disruption and its anticipated duration, and a description of alternative facilities or services, if available. The notice will be placed in conspicuous places, including entrances and service counters of the affected premises, as well as by other means such as on our website that will ensure that the notice reaches those persons potentially affected by the temporary disruption. The ultimate goal of the Club is to meet and surpass guest expectations while serving guests with disabilities. Job applicants who are individually selected for an interview and/or testing shall be notified that accommodation is available, upon request. When the applicant requests accommodation, the Club will consult with the applicant to arrange for accommodation in a manner that takes into account the applicant’s disability. Employee Supports: The Club will inform its employees of the policies used to support employees with disabilities, including accommodation plans and policies that take into account an employee’s accessibility needs. This information will be provided to new employees as soon as practicable after they begin their employment and updated information will be provided to all employees whenever there is a change to existing accommodation policies. Return to Work Program: The Club will maintain a Return to Work Program to support employees in their return to work following absences due to medical injuries and/or disabilities. The Program includes the manner in which the Club will work with the employee and the WSIB (where applicable) to assist the employee in safely returning to work. information that is needed in order to perform the employee’s job; and information that is generally available to employees in the workplace. Individual workplace emergency response procedures will be provided to an employee with a disability where it is necessary. In addition, this information will be provided, with the employee’s consent, to the person designated to provide assistance. The information will be reviewed whenever the employee moves to a different location, when the employee’s overall accommodation needs or plans are reviewed and when the Club reviews its emergency response plans. As part of the accommodation process, the Club will take into account the accessibility needs of its employees with disabilities when considering career development, performance management and redeployment. The Club will provide training on the Guest Service Standard requirements under the AODA to all employees, volunteers and others who deal with the public or other third parties on their behalf, and all those who are involved in the development and approvals of guest service policies, practices and procedures. Applicable staff will be trained on policies, practices and procedures that affect the way services are provided to people with disabilities. As changes are made to these policies, practices and procedures, the Club will provide on-going training. The Club is also committed to training employees, volunteers, persons who deal with the public or other third parties on their behalf and other persons involved in developing policies on Ontario’s accessibility laws and on accessibility aspects of the Ontario Human Rights Code that apply to persons with disabilities. Training will be provided in a way that best suits the duties of employees, volunteers and other staff members, and will be on-going where there are any changes to these policies. Training will take place as soon as is practicable and upon completion, records of training will be kept and will be available upon request. Management will be trained when there are any changes to these policies. Pheasant Run is working towards conforming the Pheasant Run website with WCAG 2.0 Level AA, and all web content available on our sites that was developed after January 1, 2012 by January 1,2021. When a request is received alternatives to standard print, Pheasant Run will consult with the person to determine their accessibility needs. Pheasant Run will determine the most appropriate accessible format or communication support depending on the accessibility needs of the person and the capability of your organization to deliver. Any Club policies that do not respect and promote the dignity and independence of people with disabilities will be modified or removed. The Club’s policies are maintained and updated regularly to reflect legislative changes and changes in practices. As we are committed to developing accessibility policies that respect and promote the dignity and independence of people with disabilities, no changes will be made to this policy before considering the impact on people with disabilities. Assistive Device – shall mean an auxiliary aid such as communication aid, cognition aid, personal mobility aid and medical aid (i.e. canes, crutches, wheelchairs, or hearing aids etc.) to access and benefit from the goods and services offered by Pheasant Run. Disability – means any degree of physical disability including, but not limited to, diabetes, epilepsy, brain injury, paralysis, amputation, lack of coordination, blindness or visual impediment, deafness or hearing impediment, muteness or speech impediment, physical reliance on a guide dog, other animal, wheelchair or other remedial appliance or device; mental impairment or developmental disability; learning disability or dysfunction in understanding or using symbols or spoken language; or mental disorder. Support Person – means in relation to a person with a disability, another person who accompanies him or her in order to help with communication, mobility, personal care or medical needs or with access to goods or services. Dignity – service is provided in a way that allows the person with a disability to maintain self respect and the respect of other people. Equal Opportunity – service is provided to a person with a disability in such a way that they have an opportunity to access services equal to that given to others. Integration – service is provided in a way that allows the person with a disability to benefit from the same services, in the same place and in the same or similar way as other customers, unless an alternate measure is necessary to enable a person with a disability to access goods or services. Persons with a disability must be given an opportunity equal to that given to others to obtain, use and benefit from the goods or services. Service Animals and Support Persons: Pheasant Golf Inc. shall allow a person with disability, who requires to be accompanied by a support person or guide dog into Pheasant Golf Inc.’s premises that are owned or operated public facilities. The person is permitted to keep the guide dog them unless the animal is otherwise excluded by law. Training: Pheasant Golf Inc. will provide training to workers, volunteers and others who deal with the public or other third parties on our behalf. Individuals in the following positions will be trained: Managers, customer service workers and maintenance workers. This training will be provided to workers at orientation or within 2 weeks of first shift. An overview of the Accessibility for Ontarians with Disabilities Act, 2005 and the requirements of the customer service standard Pheasant Golf Inc.’s plan related to the customer service standard. Feedback process: Customers who wish to provide feedback on the way Pheasant Golf Inc. provides goods and services to people with disabilities can email, call or speak to a manager in person. All feedback, including complaints, will be directed to the President of Pheasant Golf Inc. Craig Evans. Customers can expect to hear back in one weeks’ time. Modifications to this or other policies: Any policy of Pheasant Golf Inc. that does not respect and promote the dignity and independence of people with disabilities will be modified or removed.